This article is about the high priest. For his grandson, see Ahimelech II. For other uses, see Ahimelech (disambiguation). 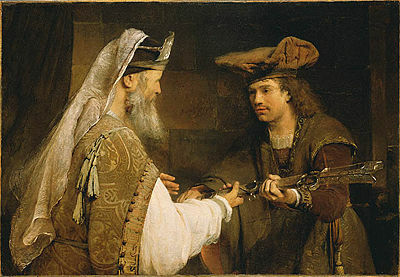 Ahimelech gives David the sword of Goliath. Ahimelech (Hebrew: אחימלך, ʼAkhīmẹleḵ; "Name means::brother of the king") (fl. 2938 AM–2940 AM) was the tenth high priest of Israel and one that had a short and tragic career. Ahimelech was a descendant of Eli. Some commentators identify him with his elder brother Ahijah. Not all commentators agree with this. The Bible gives few clues to the beginning of Ahimelech's career. However, the Bible describes its tragic end. Ahimelech established himself at Nob. David came to him there in or about 2940 AM. Ahimelech asked why David came alone and with only a handful of young men. David told Ahimelech that he was on a secret mission from Saul. He then asked Ahimelech for five loaves of bread, or whatever other supplies he could spare. Ahimelech gave David what was available: some leftover showbread. David assured Ahimelech that he and his men could properly eat this showbread because they had not recently been with any women. Unhappily, Doeg the Edomite, one of Saul's agents, was present and heard everything. Eventually he told Saul that David had come to Ahimelech for aid. Doeg said that Ahimelech had given David food and a weapon, which was true. But he also said that Ahimelech had used the Urim and Thummim to inquire of God for David, which was false. Saul summoned Ahimelech to his camp in Gibeah. There he accused him of conspiracy to commit treason and repeated the charges that Doeg had made. Ahimelech denied using the Urim and Thummim for David, but also told Saul that David had been Saul's most trusted servant and therefore Ahimelech would have no reason to doubt that David had full authority to demand every favor that Ahimelech had granted. However, one son of Ahimelech, namely Abiathar, escaped, joined the camp of David, and succeeded Ahimelech as high priest. But he would not be able to perform the functions of a high priest until after Saul was dead. ↑ Nave, Orville J. "Entry for 'Ahimelech'". "Nave's Topical Bible". <http://bible.crosswalk.com/Concordances/NavesTopicalBible/ntb.cgi?number=T192>. 1896. Accessed January 4, 2009. ↑ "Ahimelech." Columbia Encyclopedia, 6th ed. New York: Columbia University Press, 2001-7. <http://www.bartleby.com/65/ah/Ahimelec.html> Accessed January 4, 2009. ↑ 3.0 3.1 Butler, Trent C. Editor.. "Entry for 'AHIMELECH'". "Holman Bible Dictionary". <http://www.studylight.org/dic/hbd/view.cgi?number=T185>. 1991. Accessed January 4, 2009. ↑ Easton, Matthew George. "Entry for Ahimelech". "Easton's Bible Dictionary". <http://www.biblestudytools.net/Dictionaries/EastonBibleDictionary/ebd.cgi?number=T143>. Accessed January 4, 2009. ↑ Price IM, "Ahimelech," The Jewish Encyclopedia, 1906. Accessed January 4, 2009. This page was last modified on 2 August 2010, at 19:11.